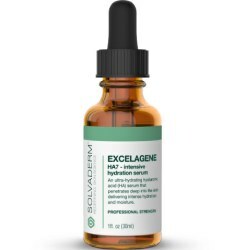 Excelagene is an intense hydrating product made by the company solvaderm. This manufacturer, who claim to ‘redefine skin science’, are reputable and well-established, producing a wide range of quality antiaging products, many of which have won consumer and industry awards. Their website is very informative and provides details regarding their research and development process, their 60-day refund policy, plus special offers and discounts. They also provide a free skincare consultation and have experts to answer any customer skincare questions. Excelagene is available to purchase directly from the website at a cost of $89.99 per 1 fl oz bottle. The excelagene serum gives many benefits to skin, it needs to not only decrease the visual aspect of lines and wrinkles, but help to take care of future damage from occurring. By minify the effects of free UV ray and radicals, and also with the help of hyaluronic acid used in the serum helps the skin giving it a firmer, smoother and more young look. Hyaluronic acid also helps the skin to redevelops skin cells and provides a glow on skin. WHAT ARE THE INGREDIENTS IN EXCELAGENE? Excelagene is a multi-action serum, providing key active excelagene ingredients that work deep down at a cellular level. It can be used on all skin types but is particularly beneficial for more mature skin that is beginning to show signs of aging such as lines, wrinkles, dry surface texture and sagginess. Hyaluronic Acid: in addition to plumping and moisturizing the skin, the Hyaluronic Acid used in Excelagene consists of two molecule weights, the low weight being able to penetrate the skin and reach the skin cells and the higher weight improving the absorption of the formula while also providing a barrier to prevent moisture loss. Carnosine: contained in the Ameliox complex, Carnosine slows the glycation process, a reaction between sugar molecules and protein which stiffens collagen and elastin. Silybum Marianum Fruit Extract: a powerful antioxidant, this fruit extract fights the damaging effects of free radicals that attack skin cells and is also included in Ameliox. Tocopherol: the third component of Ameliox, this ingredient provides photoprotection against UV rays. Shea Butter: as part of PerfectionPeptide P7, Shea butter helps the other ingredients in the formula become fully absorbed and provides intense conditioning for dry skin. Acetyl sh-Heptapeptide-1: helps to stimulate Nrf2 activity which in turn boosts the skin’s self defense system for long lasting protection against aging. Glycerin: also has conditioning effects, ensuring skin remains supple, reducing the formation of lines and wrinkles. A significant amount of online vital 3 reviews claim that the product does not work or is a hoax or scam. Excelagene serum can be used twice a day as per required, and you should clean your face and applied to freshly-cleansed skin. It can be applied on the entire neck and face, and also apply serum to the near by areas of skin as well. If you are using serum in the morning, apply a sunscreen protection cream there after for enhance protection. For improved results, it can be used collectively with other suggested solvaderm products. All solvaderm products are clinically tested for its safety and purity ahead going on the marketplace, so consumers can get assurity regarding the product that they purchasing won’t cause any long term harm and irritation to the skin. Excelagene is developed by the company solvaderm of skin care specialist and they don’t use any potential component like harsh chemical, sulfates, parabens and perfumes. Excelagene is suggested for sensitive skin and all skin types. No warning and precaution safety for excelagene because before excelagene was going on the marketplace for skincare professionals and public, it went through with a many safety and compulsory tests. HOW SHOULD EXCELAGENE BE APPLIED? The product should be applied twice a day, using just a small amount. It can be used on the facial skin and on the neck area. IS THERE A RISK FREE TRIAL? All Solvaderm products are backed with a 60-day refund term allowing consumers to see how well they work with no financial risk. Excelagene can be used by men and women who want to either prevent signs of aging from appearing or help reduce existing damage. It is suitable for all skin types, even sensitive skin as it contains no irritants or chemicals. HOW DO I KNOW WHAT IS IN THE FORMULA? The Solvaderm website includes all ingredient information for their products, including Excelagene. Key active ingredients are also explained in detail so consumers can understand exactly how they work on the skin.